SEB = Science and Engineering Building, home of the Department of Physics. GSC = Godsey Science Center. Teaching: Algebra- and calculus-based introductory physics, Quantum Theory and Relativity, Quantum Computation, Nuclear and Particle Physics, Mathematical Physics, Electromagnetic Theory, Cosmology. Research: Foundations of physics, especially quantum measurement and discrete spacetime as they relate to quantum gravity (graphs, hypergraphs, causal sets); elementary particles; Maxwell's Equations. Other: Science fiction, especially Star Trek and Isaac Asimov, comics, cooking, eastern philosophy. Glenn Harman, MS University of Tennessee, 1989. Teaching at Mercer: Introductory labs. Other teaching: Mathematics and Physics, Central HS, Macon GA.
M. Russell Lee, MS/SpD in Science Education, West Georgia CSU, 1994/2007. Teaching at Mercer: Introductory mechanics labs. 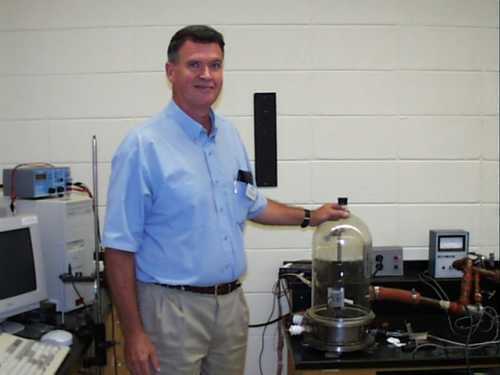 Other teaching: Chemistry and Physics, Science Dept Chair, Ola HS, Henry County. Teaching: Algebra- and calculus-based introductory physics, Descriptive Astronomy, Ancient Chinese Science and Technology, application of physics to everyday life from a "how things work" point of view, upper level courses related to experimental techniques, computerized data acquisition and solid state devices. Research: Solid state physics, thermo-physical and electronic properties of novel electronic materials such as superconductors and thermo-electrics. Other: Sailing and Chinese Language. Teaching: Algebra- and calculus-based introductory physics, Astrophysics. Research: Neutrino astronomy, analysis of Ice Cube cosmic-ray data. Other: Foodie? Research: (1) Studies of nonlinear physics, including chaos and complexity, esp. mesodynamic pendula, whose energies are intermediate between macroscopic and atomic systems. (2) Development of engineering systems based on the patented symmetric differential capacitive (SDC) sensor that gave birth to mesodynamics. Other: Soaring in high performance gliders, hunting and fishing.